TravelSkite: Building bridges. No, really. We've got the painter in: just one man in white overalls with a ladder, a trestle and a handful of brushes. He's scraping and sanding away as I write, a noise that will be background for the next month or so as he works his way around the outside of our long wooden house. It's hardly the Forth Bridge, but it's a big job, which is why it's been put off for so many years - during which, of course, it's become an even bigger job. "Like painting the Forth Bridge" is shorthand for a never-ending job, but I recently discovered that modern paints have made that saying redundant: the latest coating is expected to last 20 years. And, given the famous vagaries of Scottish weather, apparently even with the old paints, there were never more than about 90 days in a year when the painters were actually able to work on the bridge. So as cliches go, it was a lot less true than most. It's an impressive bit of engineering though: massively sturdy, carrying trains over the Forth River since 1890 on its three double cantilevers which hold hands across 2.5km. I'm forever impressed by the energy and confidence of the Victorians - they were not only incredibly busy, but they thought so BIG. The Forth Rail Bridge is made up of 54,000 tonnes of steel held together by 6.5 million rivets (the final one gold-plated and hammered home by Edward, Prince of Wales). It helped, of course, to have cheap labour and no OSH to worry about: at the peak of construction 4,000 men were working on the bridge and 98 of them died doing it. Still, nothing like it had ever been built before, and they did such a good job that even today it's the main rail crossing of the river, and 200 trains rattle across it daily. It makes the nearby road bridge, built in 1964, look positively anorexic. It's a rather boring suspension bridge, which seems a wasted opportunity. I think engineers usually love the creative opportunity of building a bridge: there are certainly some beauties around, ancient and modern too. 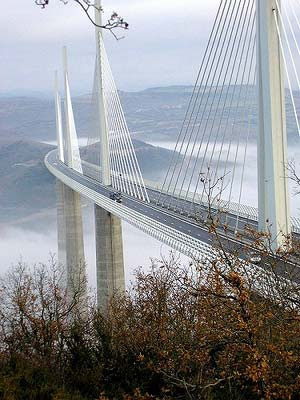 One day I'd love to go and see that wonderful one in France, the Millau Viaduct. Tells you all you need to know, that Googling 'France bridge' takes you straight to it.